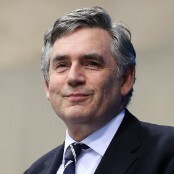 Editor's note: Gordon Brown is a United Nations Special Envoy on Global Education. He was formerly the UK's prime minister. (CNN) - Today we can tell the remarkable story of Shazia Ramzan, a 15-year-old Pakistani schoolgirl. Last October Shazia was travelling home from school with her friend Malala Yousafzai when a Taliban gunman boarded their bus and shot both of them. Malala suffered head and facial injuries and had to be rushed to hospital in the UK. Shot in the neck and arm, Shazia spent a month in hospital while her deep wounds healed. Both were attacked by terrorists who wanted to stop girls going to school. Shazia dreams of being a doctor. Fighting back from her injuries, she attempted to resume her schooling at home in the Swat Valley. So keen was she to return to school at the earliest opportunity that she ignored continuing threats to her life from the same Taliban terrorists who shot her and Malala. For months she has had to be escorted to school each day by two armed guards. Her home has had to be protected by police. Sadly, the more that Shazia spoke up, the more the threats escalated, making it difficult for her and her family to remain secure.And in the past few weeks violence has escalated across Pakistan. A female teacher was gunned down in front of her young son as she drove into her all girls' schools. A school principal was killed and his pupils severely injured when a bomb was thrown into a school playground in an all-girls school in Karachi just as a prize giving ceremony began. Only ten days ago, in a massacre which will long be remembered as the single worst terrorist assault on girls' education in recent years, the bus in which 40 female students were travelling from their all-girls college campus in Quetta was blown up by a suicide bomber. 14 girls were killed. So violent was the terrorist attack that another group followed the injured girls to hospital and opened fire on them again. Despite the public revulsion against the violence, the attacks have continued. Only this weekend two schools were blown up, while another two girls were murdered for posting a video in which they were filmed dancing in the rain.